Designed by Drone Industry Experts, our courses will get you legally certified to fly drones in the least amount of time. Click on a course to learn more. 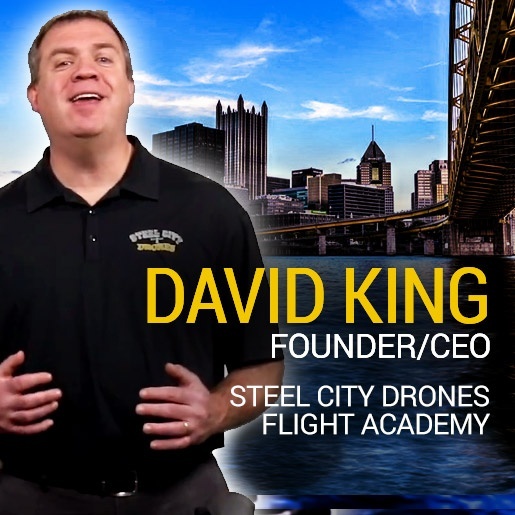 Steel City Drones Flight Academy will get you legally flying drones in the least amount of time! Our custom FAA Part 107 online courses are designed by Drone Industry Experts that understand how to teach the information you need in an easy-to-understand manner. After completing a course you will have the confidence to take the Official FAA Exam! Real Expert Instructors – Our expert instructors are available to answer your questions via email and phone. Easy To Understand – Our easy step-by-step process shows you what to study and how to prepare within the least amount of time. Only What You Need – We focus only on what you need to pass. No Filler! Expert Videos – Created by our Lead Instructor, all course topics have easy to follow video lessons for better optimal studying and understanding. Practice Tests – We provide Official FAA Practice Test for all courses. As a pioneer in the drone industry. David began his career by engineering his own heavy lifter drone systems, long before there were ready-to-fly drones in the market. Having the foresight to see the advantages of using drone technology in many applications, David developed leading services and integration technology specified to business and service industries. David has worked all over the country performing drone operations and training for hundreds of clients, public service industries and corporations alike.